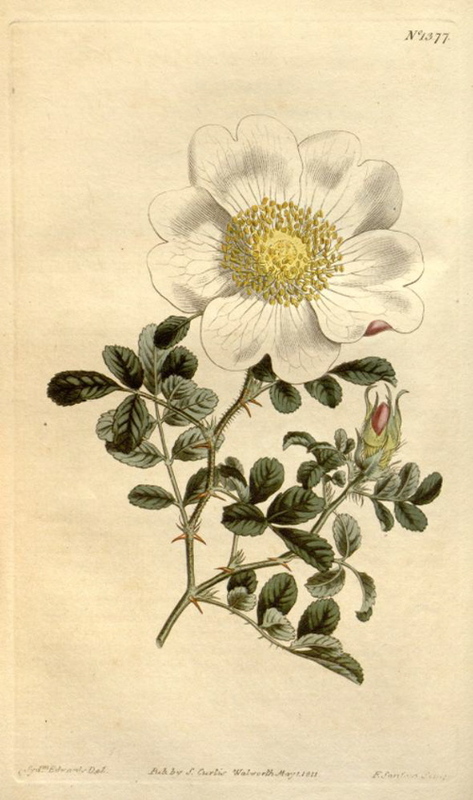 Hortus Camdenensis | Rosa bracteata Wendl. Rosa bracteata is an evergreen climber with leathery, evergreen leaves and neat, single flowers of pure white with prominent yellow stamens, comfortably growing to 4m. [RHSD]. ‘The leaves are evergreen, and the flowers fragrant: circumstances that add to its value.’ [BM t.1377/1811]. A number of varieties were available by 1854, including a double form which Rivers cautions against growing, as being totally worthless, its flowers constantly dropping off without opening. Introduced from China in 1795 by Sir George Staunton, a Member of Lord Macartney’s embassy to Beijing. [Paul (1848, 1863, 1888, 1903), Gore, Rivers (1854, 1857), Willmot, Amat]. Listed in all catalogues [T.836/1843]. 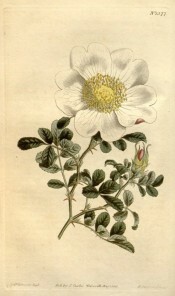 Described as the Macartney Rose in both the 1843 and 1845 catalogues. M’Cartney rose was ticked in a copy of the Hort. Reg., October 1831. Although this originally belonged to James Bowman, it is likely that this plant was grown by Macarthur earlier than 1843. [Copy held in the Special Collection of the National Herbarium Library, Canberra, ACT]. More details about Rosa bracteata Wendl.